Diane’s No Fail French Bread is the best French bread recipe ever. Simple ingredients, most of which you already have in your pantry and about an hour and a half is all you need before baking. Most of the time is rising in the bowl or on the baking sheet. French Bread. When you think French Bread, do you think of the light, airy stuff you buy in a paper bag or a plastic sack at the grocery?? I used to buy it all of the time. When we moved to Bountiful 100 years ago, my friend Diane made a loaf of this bread for me. I couldn’t believe the difference. When she shared the recipe with me, I stopped buying French bread at the grocery and started making it at home. Of course, this wasn’t any French bread, so named it Diane’s No Fail French Bread. This bread has a chewy texture, without being too dense. It’s beautiful and golden. And the recipe makes two HUGE loaves! When I asked Diane for the recipe, she told me that it turned out perfect every time (this is the Pollyanna coming out in her, I thought). But she was right. In all of the years I have been making this bread, it has never failed. 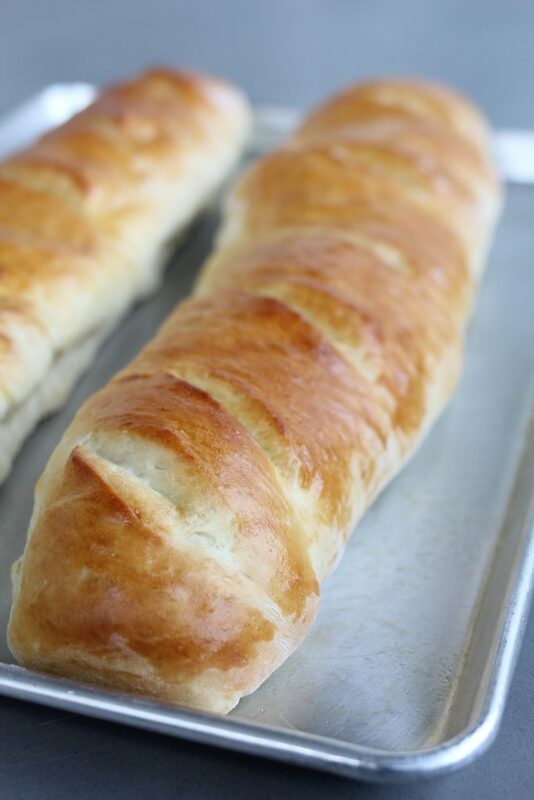 Diane’s No Fail French Bread is wonderful in so many ways: It really is so easy. Perfect bread for a novice to a seasoned cook. It blows the socks off of that grocery store French Bread you have been buying. It keeps well. Just slice and store in a bread bag or Ziplock. I like to slice it into at least one inch thick slices. Oh, AND makes the best French toast. Make this recipe tonight or tomorrow, and save a few slices for French toast! 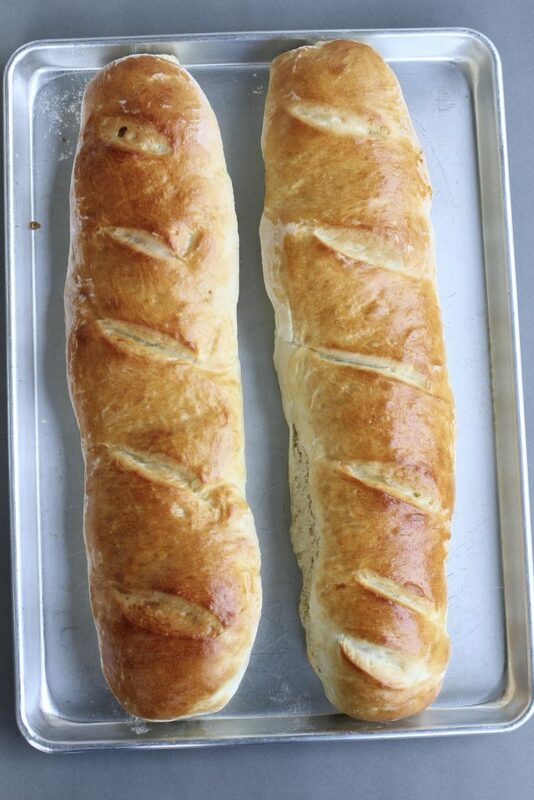 The easiest and best French bread you will ever make. Simple ingredients, mixed in a stand mixer or by hand. Makes two huge loaves! In a separate large bowl combine hot water, sugar, salt, oil and 3 cups of the flour. Stir well. Add the yeast mixture to the hot water-flour mixture. Mix together with large wooden spoon or paddle attachment. Add the remaining 3 cups of flour a cup at a time, mixing well after each addition. After all of the flour is added and mixed in, let sit in bowl for 10 minutes. When the dough has risen, stir down with a large spoon. If making in a stand mixer, turn the machine on low for a few seconds until the dough is deflated, and push dough to bottom part of bowl with a spatula. Repeat 5 times, every ten minutes, for a total of 60 minutes of rising and then punching (or pushing) down. Divide the dough in half. Roll each half of dough in a 9x12 rectangle on a floured surface. Roll the dough up like a jelly roll (long way). Place the dough on a greased baking pan (jelly roll pan), with the seam side down. Both loaves fit on one pan. Score the bread across the top 3 or 4 times, and brush with beaten egg. Let rise for 20-30 minutes in warm place. Bake at 375 for 20 minutes in lower half of oven, until golden brown. Or you may bake at 350 convection for 15-20 minutes. -I often add 1-2 cups bread flour, in place of the all purpose flour. When doing this, I use 2 cups bread flour and 3 1/2 -4 cups All Purpose flour. Watch the amount of flour if you add bread flour. In some cases, you will need only 3 1/2 cups of additional All Purpose flour. Do not add too much flour, the dough will be too stiff and hard to handle. 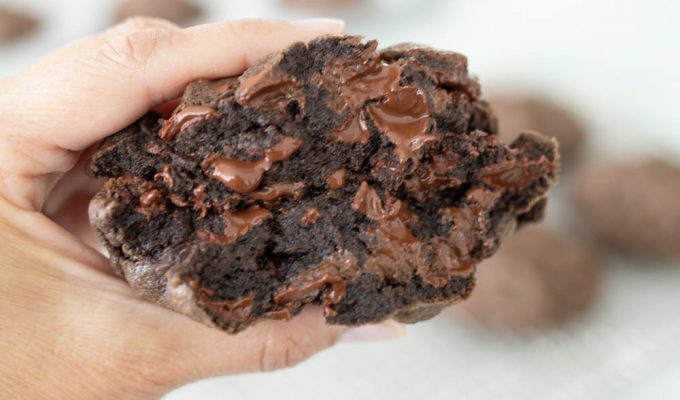 -I make this in my Kitchen Aid stand mixer. Use the paddle attachment until you have mixed in the first 3 cups of flour. Then switch to the dough hook to mix in the final 3 cups of flour. -I often forget the mixing down step (5 times every 10 minutes) and have never had a problem with the bread turning out perfect. Just make sure the bread raises in the bowl until it has almost doubled in size, or for about 45 minutes. Then proceed to the rolling out step. -If you have a convection oven, use the convection setting. Bake at 350 convection for about 15-20 minutes. The convection setting turns out the prettiest loaves of bread! Hi Si – this is Erin's sister Kelly. I really want to try this recipe but I really am bread impaired so we'll see about it turning out perfect for me. One question -you mention the first step of dissolving the yeast in the warm water but you never say when to incorporate that with the other ingredients. Did I miss something? This looks amazing! I have to try it! Thanks for the great recipe! Kelly- thanks for pointing that out! I fixed the recipe. Can you tell I need a proof reader! Let me know how it turns out if you try it. Si-I agree. I've done this same recipe for-seriously-100 years (or so it seems). The fact that my sister gave me the recipe was a clue that it had to be easy and tough to ruin! I love how beautiful bread looks. This one looks so perfect and squishy in the middle which is a must! I'll have to make my french toast like that next time too. I'm a HUGE cooks illustrated and ATK etc etc fan too. Hi…I just finished mixing this bread and am leavin git for the first 10 minutes. It is VERY wet. I mean its more like thick cake batter, not at all bread-dough-like. If you happen to catch this comment, please let me know if I need to ad more flour. Thanks! Sorry Anon I didn't catch the comment about the dough consistency earlier. The dough is a wet dough. After it finishes rising, and you are ready to turn it out onto the floured surface to shape, you may add a little more flour so it is easier to handle. I would try about a 1/4 cup at a time. The consistency of the dough will depend on your climate, elevation etc. One of the keys to making bread or rolls that are easy to handle is not adding too much flour before rolling out or shaping! How did it turn out? I made this tonight to go with some soup and it must really be no fail because it turned out perfect! I don't think my family will settle for store bought french bread anymore. We loved it! Beautiful and delicious with the perfect consistency. It was really easy, too. My son kept making bargains so he could have another piece… "If I sweep the whole floor can I have another piece?" etc. etc. Just wanted to comment that I made this with whole wheat flour and it was excellent! Thank you! I’m trying this this weekend for Valentines. One quick question. What are you saying to “repeat 5 times?” I’m not sure if you mean stirring or letting it sit longer…Please let me know. Thanks! Hi, I’d really like to make this tongiht and I’m still unsure what “repeat 5 times ” means. Please let me know. Thanks. I’ve been dissatisfied with ever other french bread recipe I have ever tried. I made your bread tonight and LOVED it! It was easy to make and the loaves were delicious and scarfed down hot out of the oven. It’s a keeper. Thanks again! Any suggestions of how long to cook it you want to make smaller loaves? Like mini baguettes? I feel like this could be awesome for making French dip sandwiches! I started making this bread about two months ago. I now make it every other day and have stopped buying store bought bread altogether. This is a great recipe and so easy. Thank you for sharing! Hey there, quick question – do you use all-purpose flour or bread flour? Thanks! Holy cow. This recipe rocks. It has ruined store bought! I just found your blog and I am in love!!! Thanks for your kind words! I’m glad you love this recipe and I’m excited you found ABK – just in time for the holidays! Keep up with my new posts by signing up for my newsletter! Just add your email address in the space on the right under my picture. To make 4 loafs at a time. When I have my whole family over, I would need more. I tried this bread and it was fantastic!!! This recipe is a keeper. Thank you!! It’s one of my favorite bread recipe’s to make, especially for the whole family. Thanks for sharing, CeAnne! I just made this recipe and they turned out perfectly. I love the texture and I love that the crust isn’t too thick. I’m so glad to hear that, Sally. I love making this recipe, it’s so easy and has the perfect texture. Thanks for sharing! I am usually very bad at making bread even though I did two years of culinary school at Johnson & Wales. But I made this recipe and my family is absolutely devoted to this bread. It is so GOOD, and it’s really easy to make. I make this so often now that I know the recipe by heart. Just a side note… My dogs love it too, if I cut some they are there immediately begging for some. I agree, Gerry, this bread recipe is hard to beat and my family always requests it for big dinners. Thanks for sharing and for reading ABK! We often make rolls for Sunday dinner (usually your Lion House recipe) but I tried this French bread yesterday. WOW. My husband says he’d rather have this than rolls, which is saying A LOT. My kids opted for more bread rather than dessert. Our guests took seconds and thirds. If *I* can make it this well, then it absolutely is “no fail”.